A pitch tube from a tree that has successfully expelled a bark beetle. Visitors to North Lake Tahoe this summer will notice the steady flow of the Truckee River, the high water level of Lake Tahoe, and dense green growth that has sprung up across the region thanks to record snow and rainfall this winter. But they’ll also see an increasing number of dead trees. The rust-colored trees dotting the hillside show that the forest is far from healthy after several years of drought left the trees more vulnerable to bark beetle infestation. Placer is one of 10 California counties where bark beetle infestations have risen so high that a state of emergency has been declared in recent years. Other counties are Amador, Calaveras, El Dorado, Fresno, Kern, Madera, Mariposa, Tulare, and Tuolumne. Though the drought recently ended, emergency declarations regarding the beetle remain in place. Bark beetle actually refers to many different species. 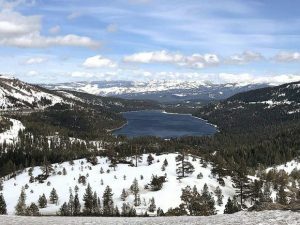 The Lake Tahoe Basin is home to the mountain pine beetle, the Jeffery pine beetle, the Western pine beetle, and the fir engraver beetle, according to U.S. Forest Service Lake Tahoe Basin Management Unit Silviculturist Rita Mustatia. She said most of the beetle damage across the Sierra is from the Western pine beetle, which attacks Ponderosa pine. In the basin, the Mountain pine beetle has hit many large Sugar pine trees, but most of the damage is done to Fir trees by the Fir engraver beetle, Mustatia said. But bark beetles haven’t always been the nail in the coffin for some of these tree species. But the drought has contributed to weaker trees that are less able to fend off infestation. Bark beetles bore through the bark of a tree where they lay eggs. 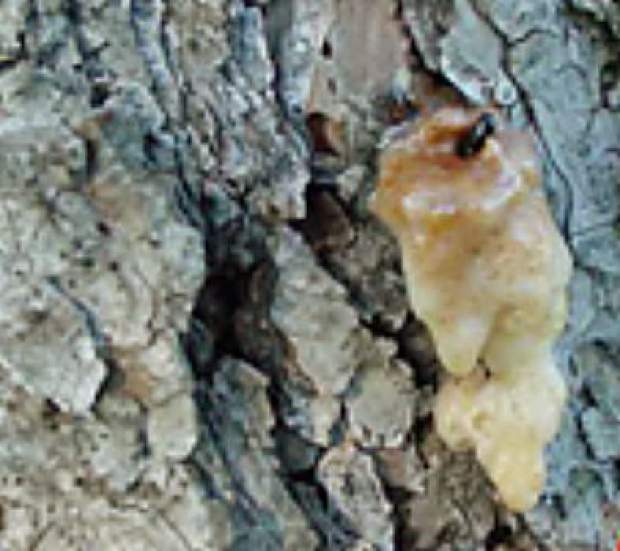 Typically, healthy trees can expel the insects by ejecting a substance called “pitch.” When a tree is healthy, the pitch can push the beetle out, or “pitch out” the beetle. When a tree is stressed, which can be caused by a variety of factors including drought and overcrowding of forests, it is often less successful in fighting off the infestation. When bark beetles kill already unhealthy trees, the trees can become dangerous because of their risk of falling or fueling a wildfire. A Forest Service aerial survey conducted in 2016 found more than 62 million trees in California died that year alone, a more than 100 percent increase over the number that died in 2015. From 2010 to November 2016, the Forest Service estimates that more than 102 million trees have died statewide, with the majority of those in counties along the southern and central Sierra. The total number of dead trees between 2010-2016 is estimated at 774,000 in Placer County, according to an April report from the Tree Mortality Task Force, which was created in 2015 by Gov. Jerry Brown to address tree mortality. About 557,000 of those trees died in Placer County in 2016, alone. El Dorado County, which is also one of the 10 counties hit hardest, has lost 1,694,000 trees since 2010. To be fair, the survey measures the number of dead trees and not necessarily those dead due to bark beetle infestation. But McEldowney said that the high population of bark beetles exacerbates the tree mortality problem. “The tree mortality and the bark beetle issues are intricately connected to each other,” he said. In addition to bark beetle and drought, McEldowney said that forest management was another contributing factor. “There’s debate on this, but a lot of people think that the forest is overgrown and too thick after years of fire suppression,” McEldowney said. 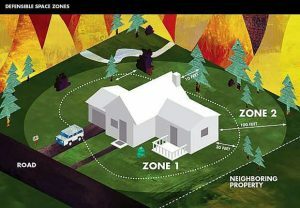 As the Sierra Sun previously reported, fires used to come through forested areas naturally and clear out any fuel, such as brush, branches, and pine needles. When humans began putting out fires rather than letting them burn out, fuel accumulated over the years, and new plants and trees sprung up that otherwise wouldn’t survive. As a result, the trees and plants are more crowded than they used to be and less healthy, since they’re fighting for sunlight, water and nutrients. Add to that a multi-year drought, and the result is a bark beetle’s dream. That’s because it has long been known that one year of heavy precipitation isn’t enough to cure California’s forests. “It’s OK to have death in the forest, but not a sea of it,” said Truckee Ranger District Spokesperson Debby Broback.